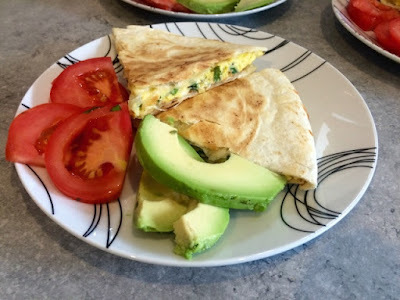 I’m forever looking for yummy weekend breakfast ideas that don’t involve a fry up. I feel like breakfast at the weekends should be a bit of a treat as Monday to Friday I barely have enough time to wolf down half a bowl of cereal before I’m out the door. However, one can’t be having a full English breakfast or sausage and bacon sarnie every Saturday and Sunday. My tummy would love it, but my waistline not so much. I know, I know there are endless combinations of yoghurty, fruity, oaty, porridgey concoctions floating about in the world of food blogs/pinterest etc., but sweet breakfasts just don’t float my boat. Scrambled eggs and omelettes or avocado on toast have been my go-to weekend breakfasts of choice of a while now but it’s getting a bit old and boring. I like a bit of variety in my meal planning. 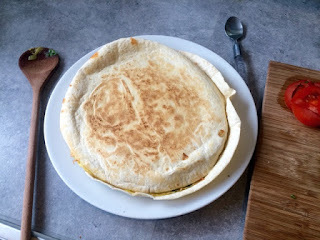 So I was absolutely delighted to stumble upon the marvellous idea of breakfast quesadillas. I love a good quesadilla. I haven’t featured one on the blog yet so perhaps it ought to go on the to-do list. I find they make a great light meal and you can make them as simple and stripped back or as indulgent and bursting with different fillings as you like. 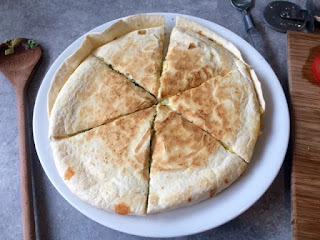 If you’re not familiar with quesadillas, you need to get yourself better acquainted. 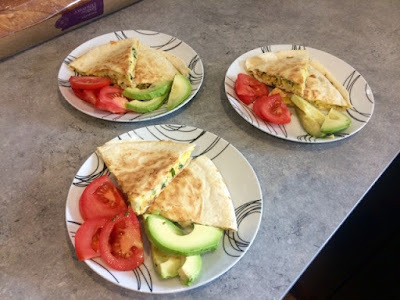 They are basically two grilled tortilla wraps filled with chicken (most commonly), a few veggies and the whole thing held together by a bit of melted cheese. Think of it as sort of a Mexican cheese toasted sandwich type thing. My favourite filling is chicken with onions and peppers and served with some guacamole and sour cream for dipping, but I’ve seen all sorts of different combinations, including steak or pulled pork or vegetarian versions with black bean fillings. The breakfast version uses an omelette as the filling and a little melted cheese to hold everything together. I try to be quite sparing with the cheese to keep it light but if you’d rather it was oozing with melted cheesy goodness by all means use as much as you like. 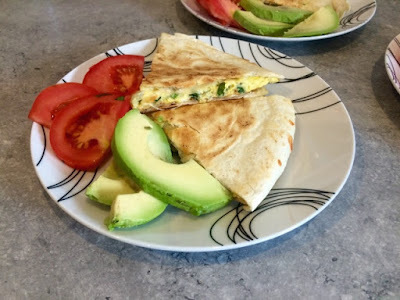 I make one big quesadilla and then slice it into six pieces so The Boyfriend, my step daughter and I have two wedges each with a little tomato and avocado on the side. I find this quite a child friendly dish as you can mix and match filling to suit their tastes and its something you can pick up and eat with your hands. As great an idea as this is, I would love to claim it as my own, however I can’t. I saw this done on somebody else’s blog and made my own version. Unfortunately I follow so many different food blogs I can’t remember where the original recipe came from and I can’t seem to track it down. So if this was your idea, thanks! Please let me know so I can credit your genius and I hope you think my version has done it justice. I’ve made this a few weekends in a row now and it’s going down a treat. 1. 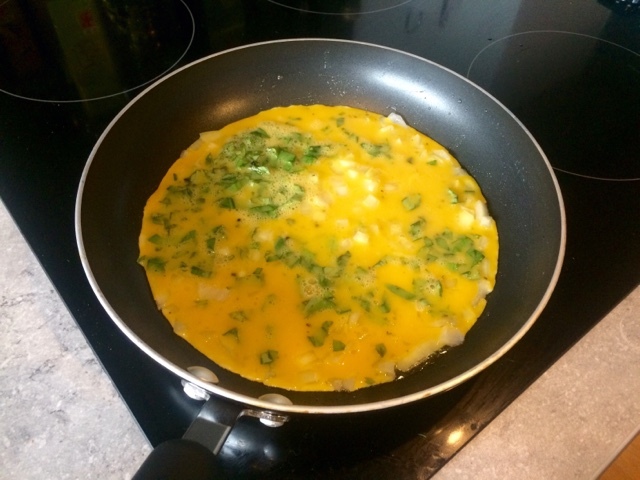 In a jug, whisk together the eggs, add the basil and season well with salt and pepper. 2. In a large frying pan gently sautée the onions until softened. 3. Pour in the eggs and allow to cook and set from the bottom up. 4. 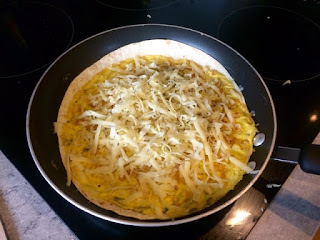 When mostly cooked through, sprinkle on half of the cheese and lay on one of the tortillas and allow the melting cheesing to stick it to the omelette. 5. Flip omelette out onto a plate, tortilla side down. Slide back into the pan, tortilla side down. 6. 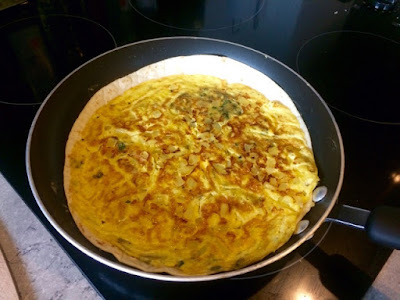 Top with more grated cheese and lay on the other tortilla. 7. 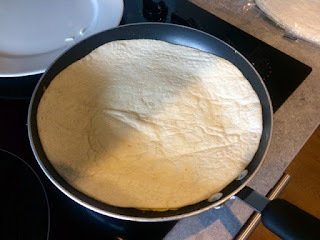 Use the plate to flip the quesadilla out of the pan and return to the pan with the second tortilla face down to allow it to brown a little. 8. Remove from the pan and use a pizza slicer to cut into as many slices as you need. As there are three of us, I sliced it into six, allowing 2 slices each. 9. Serve immediately with slices of tomato and avocado, seasoned with a little salt.